By PolitiFact Staff on Monday, November 5th, 2018 at 1:48 p.m.
PolitiFact has been fact-checking races in 16 states this year. Here is our summary of where the races stand in the final days before elections. 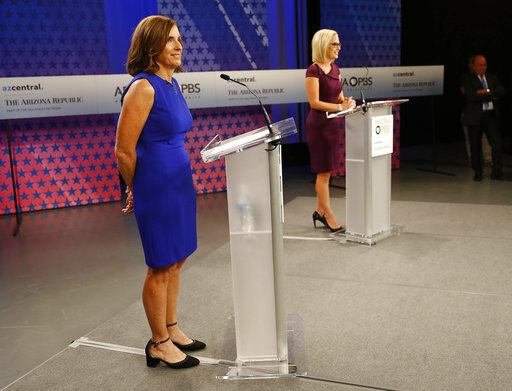 The race between Sinema and McSally for the open seat held by retiring Sen. Jeff Flake has been filled with aggressive campaigning between two current members of the U.S. House of Representatives. Since entering the Senate race, McSally has adopted a more conservative stance on immigration and has become more vocal in calls to build a border wall with Mexico. An Air Force veteran, McSally serves on the Armed Services and Homeland Security committees; she was first elected to Congress in 2014. Some of McSally’s campaign has focused on attacking Sinema for her role as an activist opposing the Iraq War. Sinema, a member of Congress since 2013, serves on the House Committee on Financial Services. Sinema is campaigning as an independent — her promises include expansion of health care access. Sinema was one of 18 Democrats who voted in favor of a July resolution stating explicit support for Immigration and Customs Enforcement and denouncing calls to abolish the agency. Most Democrats voted "present." The candidates voted with their parties on the Republican tax bill (McSally voted for it, Sinema against) and on the 2017 effort to repeal of the Affordable Care Act (McSally voted for it, Sinema against). Two Democrats are squaring off due to California’s ‘top-two’ primary system, in which voters select the top two candidates regardless of party affiliation. Feinstein is the longtime incumbent who was first elected to the Senate in 1992. She drew criticism this year for her role as the leading Democrat on the committee that oversaw Justice Brett Kavanaugh’s Supreme Court confirmation hearings. Conservatives said she was unfair to Kavanaugh; progressives said she wasn’t aggressive enough. De León was elected to the California State Assembly in 2006. Four years later he was elected to the State Senate. He became the State Senate Leader in 2014. De León won the endorsement of the California Democratic Party in July 2018 and is considered more liberal than Feinstein. Polling, however, has showed Feinstein leading the race. Nelson, first elected to the U.S. Senate in 2000, has been a familiar fixture of Florida politics for decades and is currently the only statewide Democratic officer holder. He’s being challenged by Scott, the two-term governor of Florida, who’s painted Nelson as a career politician and a socialist. The Florida Senate race is expected to be one of the most expensive Senate races in the nation. It should also be close; polls show Scott and Nelson running neck and neck. The only questions left are which way independents will lean and whether the attention drawn by Tallahassee Mayor Andrew Gillum, the African-American Democrat running for governor, will carry over to more Democrats turning out to vote for Nelson. Scott, an ally of President Donald Trump, has emphasized his promise, largely fulfilled, to create 700,000 jobs in 7 years. While Scott ran as a conservative in 2010, he moderated some of his views during his tenure, including on immigration. Scott is also known for his prior tenure as CEO of Columbia/HCA, a hospital company, where he quit in 1997 shortly after federal agents went public with an investigation into the company that later led to a $1.7 billion fine for defrauding Medicare, TriCare and other government health care programs. Donnelly is a moderate Democrat fighting to hang onto his seat in a state Trump carried by 19 points. He was elected to the Senate in 2012 and previously served three terms as a U.S. representative. Braun is a Republican state senator who likens himself to Trump as an outsider and businessman. On the campaign, Braun frequently touts his accomplishments in his private business, an automobile parts distribution company. Donnelly has used that as ammunition to showcase problems in Braun’s business practices. In return, Braun and Republican PACs have tried to paint Donnelly as ineffective and more liberal than his voting record shows, particularly on immigration. Smith was appointed to the Senate to replace Democrat Al Franken, who resigned amid accusations of improprieties with women. She prevailed over several Democratic contenders in the Aug. 14 primary. On the Republican side, Housley, a state legislator, is the nominee. This is actually one of two U.S. Senate races in Minnesota in November, but the other — the reelection bid by Democratic Sen. Amy Klobuchar — isn’t considered competitive. Smith has maintained modest leads for the duration of the campaign. McCaskill was first elected in 2006, and despite Missouri increasingly becoming a red state, she won a second term in 2012 against controversial social conservative Todd Akin. Since then, McCaskill has been in Republicans’ sights. Hawley has been touting his conservative credentials in a state that has become more red in recent election cycles, as well as highlighting McCaskill’s long tenure in Washington, saying she’s out of touch. The contest has been among the closest in the country for most of the campaign. The two have sparred over such issues as health care; Hawley signed on to a lawsuit to overturn the Affordable Care Act, which McCaskill says threatens protections for preexisting conditions. Hawley championed the Supreme Court nomination of Brett Kavanaugh, while McCaskill voted against it. This race may come down to the wire, according to polling data. Tester, a Democratic incumbent running in a state that Trump won handily in 2016, is considered vulnerable. He provoked Trump’s ire by derailing White House physician Ronny Jackson’s nomination to head the Department of Veterans Affairs, and by voting against Trump’s Supreme Court nominee Brett Kavanaugh. Trump has endorsed Rosendale, and rallied for him in Montana. Tester has been a U.S. senator since 2006. He is currently ranking member on the Senate Veterans’ Affairs Committee, a particularly meaningful role given Montana’s large veteran population. Prior to becoming a U.S. senator, he served in the state Legislature, where he was president of the Montana Senate. Rosendale clinched his primary June 5 with support from former Trump White strategist Steve Bannon and financial backing from conservative groups. Rosendale, the state auditor, previously served in the state Legislature, where he was first elected in 2010. Heller was elected in 2012 after being appointed by Nevada Gov. Brian Sandoval. Before that, he served three terms as U.S. Representative from Nevada’s 2nd Congressional District, and before that, three terms as secretary of state. Heller co-sponsored the last-ditch Republican effort to pass a health care bill to replace the Affordable Care Act with block grants to the states. Rosen is a first-term representative from Nevada’s 3rd Congressional District, which extends from the southern portion of Las Vegas to many smaller communities southwest of the city. She worked as a systems analyst for CitiBank and Southwest Gas, a regional utility. She supports the Affordable Care Act and has criticized the Republican tax bill as too generous to the wealthy. The race is considered a toss-up. Democrat Hillary Clinton won Nevada in 2016 by less than 2 percent, and while Heller is vulnerable and some polls give Rosen the edge, it is only by a slim margin. Heitkamp won a rare statewide victory for a Democrat in North Dakota in 2012 by a margin of less than 1 percent. While she is one of the more moderate Democrats, the state has swung right since her election. Trump won the state with a 36-point margin. Cramer is the state’s sole representative in the House, a seat he has held since 2013. He was also one of the first Republicans to endorse Trump, and served as a close adviser in crafting the Trump administration’s energy agenda. Immigration, health care and personal attacks have dominated the race. Republicans have tried to paint the moderate Heitkamp as far more liberal than her record shows. Heitkamp has in turn attacked Cramer on his health care votes, saying he would strip coverage from North Dakotans with pre-existing conditions. Brown joined the U.S. Senate in 2007 after serving in the Ohio House, as Ohio secretary of state and in Congress. Brown, the only statewide Democrat in Ohio, is best known in the Senate for his longtime opposition to trade agreements and his support for labor. Renacci, endorsed by Trump, represents Ohio's 16th Congressional District and was first elected to Congress in 2010. He previously served as the mayor of Wadsworth and owned multiple businesses including nursing facilities, a CPA firm, real estate and auto dealerships. He easily won the May primary against businessman Mike Gibbons. This race has been less competitive than the governor’s race, according to many polls that have shown Brown with a lead. In 2016, Donald Trump won the state by 8 percentage points. Blackburn was first elected in 2002 to represent Tennessee’s 7th Congressional District and has been re-elected ever since, never falling below winning 66 percent of the vote. She opposes abortion and is a member of the Pro-Life Caucus. She voted for the 2017 House bill to repeal the Affordable Care Act, and supports the Republican tax law. Blackburn has embraced President Donald Trump, and he has come to Tennessee for rallies to boost her chances. The only issue where she has distanced herself slightly from Trump is on tariffs, which would affect Tennessee firms, including the auto industry. Bredesen was Tennessee’s governor from 2003 to 2011 and was mayor of Nashville through most of the 1990s. Before he turned to politics, Bredesen built what became one of the country’s largest investor-owned health maintenance organizations at the time. Bredesen positions himself as a pragmatist, saying he will work with Trump when his policies would help the state, and oppose him when he thinks they wouldn’t. He has spoken out against trade tariffs. He criticized the Affordable Care Act when it passed in 2010, but has since softened his stance to say it should be fixed. This race is is close. Outside groups bought many ads in the race. Cruz seeks his second term after a high-profile run for the Republican nomination for president in 2016; he lost to Donald Trump. After feuding with Trump for the presidential nomination, Cruz has since campaigned with President Trump for his Senate re-election. Cruz has campaigned against illegal immigration and for low taxes and less regulation. O’Rourke, a member of the U.S. House of Representatives representing the El Paso area, has challenged Cruz in a bid that has drawn support from Democrats around the country. O’Rourke has emphasized bipartisanship, health care, more open immigration policies and criminal justice reform. After seven terms in the U.S. Senate, incumbent Republican Sen. Orrin Hatch announced his plan to retire in January 2018. Hatch said he would only retire if Romney ran. In spite of his attacks on Trump during the 2016 election, Romney counts on Trump’s endorsement. Wilson has been an at-large member of the Salt Lake County Council since 2005. Romney’s path to clinch the Senate seat in the general election has been one of the most serene this cycle, with polls consistently showing a significant lead. Kaine, who formerly served as governor and later as chairman of the Democratic National Committee, won his Senate seat in 2012. He was selected in 2016 to serve as Democratic presidential nominee Hillary Clinton’s vice presidential running mate. He has remained a leading critic of Trump. Stewart, chair of the Prince William County Board of Supervisors and the Trump campaign’s former Virginia state chair, has called himself "Trump before Trump was Trump" and pledged support to the president’s agenda. He has come under fire for his ties to avowed white supremacists and anti-Semites. Kaine is considered a favorite to retain his seat. Manchin, who formerly served as governor, won his Senate seat in a special election in 2010 and was elected to a full term two years later. Since his initial election, West Virginia has become an increasingly Republican state, raising Republicans’ hopes of ousting him. But Manchin, a conservative Democrat, is a longtime fixture in the state’s politics, and he’s made nods in some key votes to Trump, who won the state with 68 percent of the vote. Morrisey, elected state attorney general in 2012, has touted his conservative positions on issues such as abortion and guns, and he’s charged that Manchin can’t represent the state as a member of the Democratic Party because the national party is at odds with many issues important to West Virginians, including coal and the environment. Manchin has maintained a narrow edge through much of the campaign. Candidates: Incumbent Democrat Tammy Baldwin vs. Republican Leah Vukmir. Baldwin, of Madison, is a first-term incumbent. The race she won in 2012 was for an open seat. Baldwin previously served in the U.S. House and in the Wisconsin Legislature. Vukmir, of suburban Milwaukee, is a nurse who currently serves in the Wisconsin Senate. She is endorsed by the Wisconsin Republican Party and touts herself as a proven conservative. Baldwin has had the advantages of incumbency and no primary opponent, as well as more name recognition than her opponents, but Wisconsin can be a hard to state to figure. For example, Baldwin is one of the most liberal members of the Senate while Wisconsin’s other senator, Republican Ron Johnson, is one of the most conservative.